Early June, Maasai Mara, Kenya. The long, dry season had set in, marked by clear blue skies and grass that was beginning to turn yellow. I kept losing sight of animals as they disappeared into the tall grass. However, sometimes they did re-emerge further along the track. Hunter did so one morning. He paused to glance at me, alert and poised. He seemed momentarily puzzled but then he eased and I saw a glint in his eyes. The short rains, mid – November, Maasai Mara, Kenya. The sky rumbled and the day became a waxy grey, weighed down by the rain that fell like a waterfall. 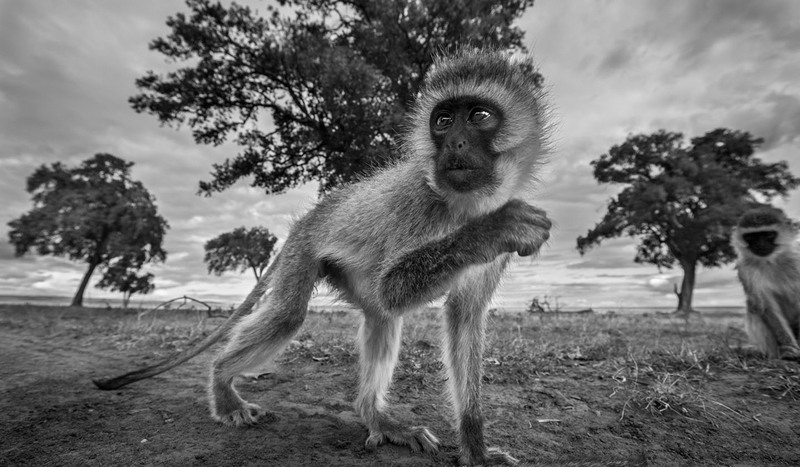 But soon the rain meandered away and the vervet monkeys got on with feeding as the circle of weather turned once again. The long, dry season, mid – August, Maasai Mara, Kenya. I was waiting by the river for elephants. Time passed, silence took hold, and the river seemed to flow to a standstill. And then. 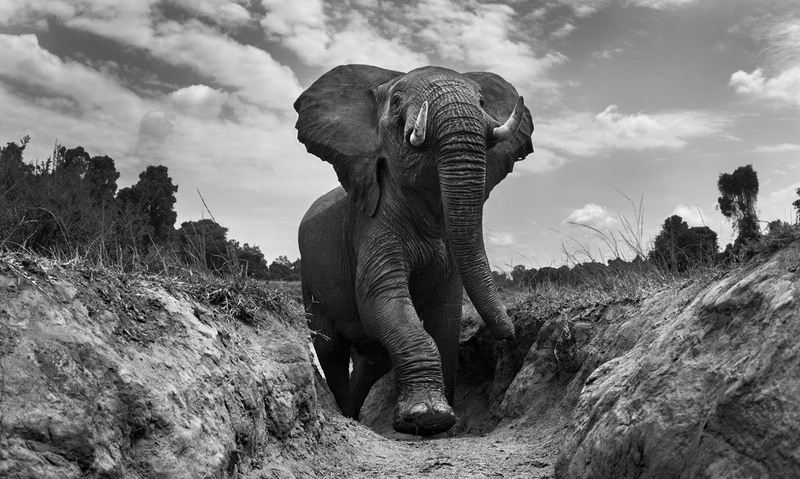 Wading through the river, the bull elephant ascended a steep gully. He sensed an intruder and lifted his trunk up in the air. Behind that masked visage his senses were on alert. 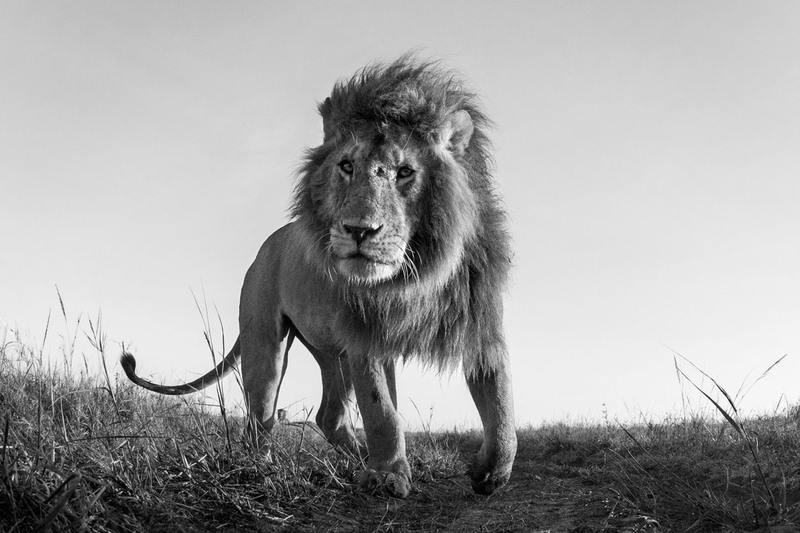 He looked so imposing surely even a lion pride would not dare confront him. Here is a body language that exudes strength. The short dry season, mid – February, Maasai Mara, Kenya. For a good many days harsh sunlight had been pounding down relentlessly. I found a cheetah mother, Malaika, and her four energetic cubs, not too far away from camp. At an opportune moment I positioned the camera, hoping for an eye contact portrait. Unlike their disdainful mother, one of the cubs was irresistibly drawn to working the camera out and obliged, wearing both dare and caution on its face. The short dry season, early January. Near Mara River there is an exposed hyena den, a meeting place for clan members, some of whom come and go while languid mothers with pups drape themselves across the den. All the members are highly conscious of their respective ranks in the clan’s hierarchy: the meek go out of their way to grovel before the disdainful ones that strut at the higher echelons. One such creature of the plain rose up out of the swaying grass, like a mud lump given to life, and shambled forward with haste, shimmering on the land and cringing bear-like. It shuffled boldly toward the den but then, sufficiently overcome with curiosity, deviated to peer at the camera, anticipation worn on its face. I released the shutter. After a while it lost interest and ambled away without telling me what it thought of it. The long, dry season, mid – August, Maasai Mara, Kenya. I’ve been told that the aggressive body language of wild animals is usually just a bluff. In this light, I think of my encounter with Joe the hippo. He was out there in a pond, cast out by the pod, and had no females to guard. He was pretending to be hard, but I decided not to hang around to see if he would charge, warned by the surprise and anger on his face. The short dry season, late January, Maasai Mara, Kenya. I tend to treat buffaloes with respect, not least because a single buffalo can take on and put to flight a lion or two. They have a poor image though, as cross, even hostile creatures. But I would say that it’s not quite like that. They don’t mean to hurt, they just need their space. They’re not cunning, they just care about their privacy. They are not malevolent, they just like to mind their own business. And even when they show aggression, it’s usually only pretend. An attitude I guess. The long, dry season, mid – July, Maasai Mara, Kenya. The lioness was waiting to ambush the wildebeests as they clambered over the steep river bank. She spotted an exhausted wildebeest mum walking with her baby alongside. The mum was looking wary but still the lioness gave it a try. She stalked carefully in suspended suspense, taking her time. And then, an opportunity, a throttling, and the calf’s eyes were dimmed. The short dry season, mid – February, Maasai Mara, Kenya. The heat piled on and I headed for the Mara River which meanders like a drunken fly through the reserve. At a hippo-infested bend, elephants cross the river in search of succulent plants in swamps bordering the lazy river. A cool breeze formed momentarily and a few clouds gathered. A bull elephant waded across and caught my strange scent. He flared his ears and stood hunched in a suspended stance. Then, raising his trunk like a question mark in sky, he altered his course, not in flight but wary.